On Monday, December 8th, the NHLPA Goals & Dreams (G&D) fund continued its multi-city 15th anniversary tour in the nation’s capital - Ottawa, Ontario - for a fun-filled afternoon of hockey with Ottawa Senators players Chris Phillips, Zack Smith, Colin Greening and Curtis Lazar, as well as 30 local children from Sledge Hockey of Eastern Ontario (SHEO), Project North, and the Ottawa Inuit Children’s Centre (OICC). The event kicked off at the Bell Sensplex, where the NHLPA G&D fund presented its donation of $25,000 worth of hockey equipment in the form of 10 sleds and 10 sets of equipment for SHEO, and 25 complete sets of hockey equipment which will be distributed across Project North / OICC. G&D, the largest grassroots hockey assistance program in the world, has contributed over $22 million to grassroots hockey programs and given more than 70,000 children the opportunity to play hockey in 32 countries since being established in 1999. It has worked with many hockey assistance programs in the past, and has a longstanding relationship with Project North and SHEO, which made Ottawa an ideal place to stop for the tour. 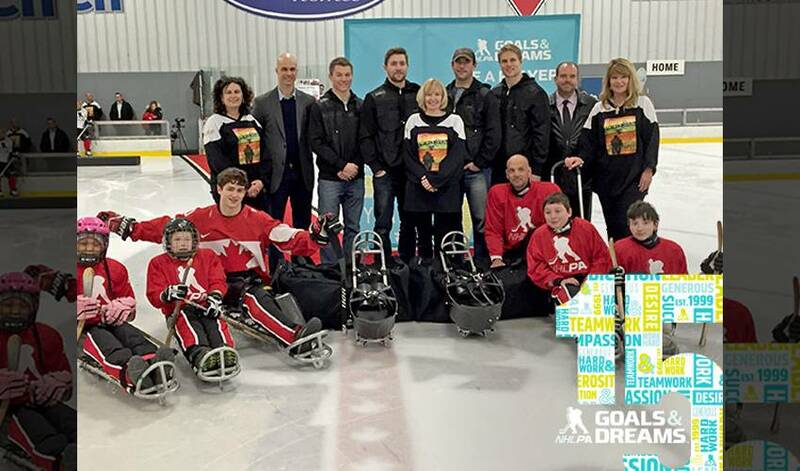 Following the donation, two teams of participants hit the ice for a friendly Goals & Dreams Cup hockey game coached by none other than NHLPA members Chris Phillips, Zack Smith, Colin Greening, and Curtis Lazar. Project North’s Honourary Chair, Mrs. Laureen Harper, was on hand for the ceremonial puck drop, and two young ladies from Project North performed the national anthem as well as some traditional Inuit throat singing, before Team White - coached by Chris Phillips and Colin Greening - faced off in an exciting game against Team Red - coached by Zack Smith and Curtis Lazar. Local VIP’s including Ottawa Police Chief Charles Bordeleau, Ottawa 67s owner Jeff Hunt, and Senator Vern White also participated in the exciting game. Prior to the game, former CFL player Ken Evraire emceed the opening ceremonies before the game. He acknowledged the G&D ambassadors in attendance – Devin Smith, Matt Langen and Rob Zamuner – as well as the representatives of each of the organizations: Andrew Henry and Kelli Tonner of SHEO; Michelle Valberg and Jeff Turner of Project North; as well as Karen Baker Anderson of OICC. Zamuner spoke on behalf of the NHLPA about the meaning of G&D to the players, before a group photo involving all of the NHLPA members, children, ambassasdors and representatives was taken on the ice. Also in attendance was Olympian Ben Delaney, who helped Team Canada bring home the bronze medal in the Paralympic sledge hockey final in Sochi, Russia earlier this year. He was the youngest athlete on the team. Ben always played hockey, but at the age of 12 was diagnosed with osteosarcoma - the same cancer as Terry Fox. Following an above the knee amputation, Ben knew he still wanted to play the sport. Not one to let anything hold him back, he quickly took up sledge hockey. It was particularly special to have Ben involved with the event because he actually got his sledge hockey start with a G&D sled donation to SHEO in 2010. “It’s great to give back to the NHLPA after everything they’ve done for the SHEO organization. The first sled I ever had was donated from them and it was great to have that to start off because the sleds are very expensive and when starting the sport you don’t know if you will commit and get competitive with it so they really helped me. It’s really nice to be here and to give back. It was a lot of fun,” said Ben following the game. To conclude the event, the kids were presented with keepsake G&D Cup trophies to commemorate the day. The NHLPA Goals & Dreams Anniversary Tour will make its next stop in Vancouver on December 18th. If you’d like to get involved with Goals & Dreams, fans have a chance to bid on game-worn jerseys by NHL players through a series of auctions for each tour stop. All proceeds from the auctions will be donated to the programs involved with the tour through the G&D fund.